Khaolak Hotel & Resort - Casa de La Flora, Khao Lak Resort Thailand - Hotel Official Website. is located directly on the beautiful, palm-fringed beach of Khao Lak, just 1.20 hours drive, by car from Phuket International Airport. This ultimate design resort with stunning Andaman views as well as its friendly service warmly welcome visitors from across the globe. 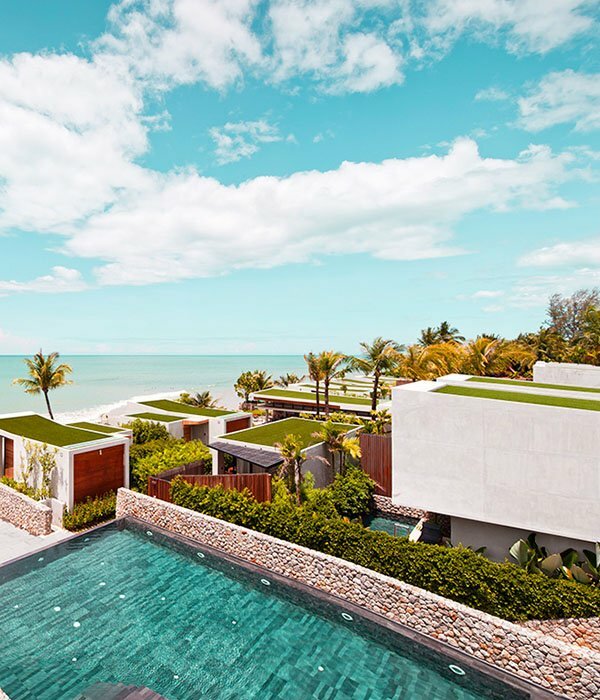 We are proud of being the first modernist hideaway in Khao Lak, presenting cutting-edge architecture and unique design amid tropical nature. Whether you'relooking fora romantic hideaway or aluxury holiday experience, Casa de La Flora is definitely a perfect choice. Booking now and get our best rate for your upcoming holiday. Although Studio Pool Villas are most compact among other categories, all modern comforts and luxuries are so prevalent. These suites are set in the rear part of the property. There are two stories in each suite. These Duplex Grand Pool villas are set further back from the shoreline with two floors, all with private pools with terrace and spacious living room on the ground floor. Whereas villas in this category are slightly more compact than the other beachfront ones, comfort and luxury are never compromised. This lovely suite is next to the Casa Presidential Suite, set in the rear of the property. These five villas are situated by the beach with panoramic ocean views. Each villa offers a large comfortable bedroom with a nicely sized living room. At the rear of the property lies the great Grand Pool Suite. What makes this suite so special is its really stunning ocean view as it is in an elevated position. This villa is situated by the beach with spectacular views of the ocean. The beautiful scenery makes this villa secluded and special. If you look for something exciting, then come and explore with us.We can make it a tailor made excursion just for you. Spa la casa delivers memorable spa experiences to offer a delicate balance of refreshment for your mind and body. This lovely restaurant by the beach offers the pleasant and relaxing ambience of the serene beach.